Morning mist lifts from fence lines drawn between farm fields draped in melting snow; ghostly shrubs, veiled in frigid fog, lurk behind the glistening vapors of dawn. Such were the scenes of the second thaw of the month as mild temperatures returned to the area during the latter half of February. The snow and ice that had accumulated over previous weeks quickly melted and flowed to our watercourses. First-order streams (the smallest streams under current stream classification systems, also known as headwater streams) are the first to swell with meltwater. These tributary stream channels fill and flow rapidly toward larger waterways, with water volume and velocity increasing as temperatures above freezing continue to contribute matter and energy to the system. Higher-order streams—like our rivers—accept the contributions from many tributaries; their levels crest as water levels in low-order streams subside. All of this makes for some dramatic scenes around the area. Here at Severson Dells, one of the salient features of the landscape is the first-order stream that we call Hall Creek. It has its origins north of Montague Road and enters our forest preserve from the west, meandering through many switchbacks on its way to the Rock River. When the thaw began I went out to see how rapidly it would fill. On February 19 it was flowing freely. On February 20 it had overflowed its banks. And this was before the Kishwaukee or Rock Rivers had risen appreciably. Left: Hall Creek begins to rise, February 19, 2018. Right: Hall Creek in flood, February 20, 2018. A healthy, resilient waterway can accommodate flooding. The curves and bends of a meandering stream serve to limit the velocity of the water as it flows. The floodplain along the banks can accept the overflow, gently ushering the excess water downstream. The natural vegetation of the floodplain helps to protect the soil from erosion. Even during the dormant season, the roots of those plants are holding the soil. The resilient functionality of Hall Creek was in evidence on February 20, the second day of the big thaw. Floodwaters overran the channel of the creek and spread out onto the frozen floodplain. The creek ran through braided channels and flowed over new terrain. The watercourse carried meltwater that might otherwise have found its way into basements or across roads. Unlike this stretch of Hall Creek, many of our streams have been channelized, ditched and straightened in an effort to increase tillable acreage and improve productivity—and to whisk away excess water as quickly as possible. Unfortunately, that engineered efficiency comes at a cost: all of that fresh water is taken away when it might otherwise have been returned underground to recharge our fresh-water aquifers. Groundwater recharge is an important function of wetlands like the floodplain forests and riparian marshes that line healthy streams. Ditched channels with steep banks hasten erosion and carry sediment, rich in organic matter, rapidly away to places where the silt is likely to do more harm than good. The meanders of a natural stream like Hall Creek slow the flow of water, reducing erosion along the banks and allowing more water to go underground. The area in the foreground is usually well above water, with Hall Creek confined to a channel behind. 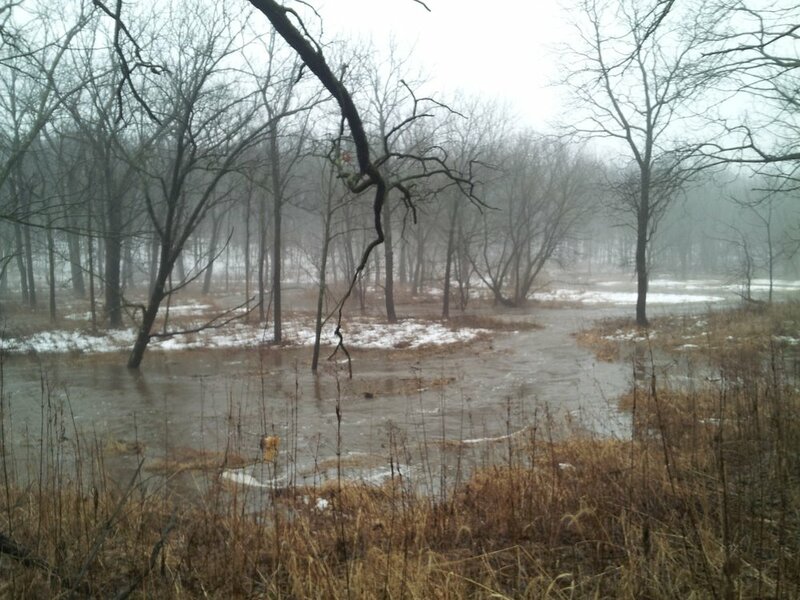 The floodplain deftly carried the excess water downstream toward the Rock River. Before the first wildflowers of spring open to the warming sun, our streams come alive, dancing with water drawn from melting snow.